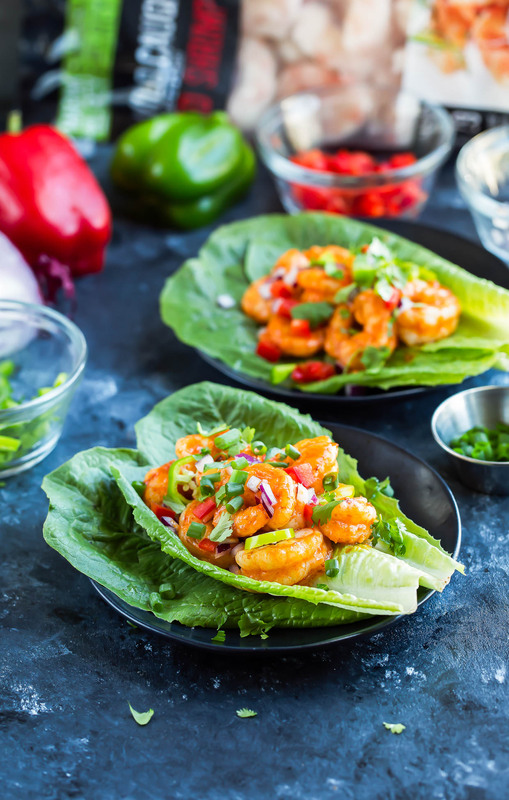 These spicy Buffalo Shrimp Lettuce Wrap Tacos are fast, flavorful, and ready to Taco Tuesday your face off! Each tasty taco is gluten-free, paleo-friendly, and keto friendly too. Woot! Today I’m over the moon excited to share these rock-your-face-off Buffalo Shrimp Tacos. I skipped the tortilla and lettuce wrapped these bad boys because a. that means I get to eat more of them and b. I love having gluten-free eats in my arsenal. With both boxes checked I got to work on creating the most amazing shrimp recipe for my friends (and partners) at Marina del Rey. I legit had to make and photograph this recipe twice because I forgot to eat before starting the first shoot and ate 90% of the shrimp right out of the pan when they finished cooking. Even the second time around I got dangerously close to eating the merchandise way before I was finished shooting. I cannot be trusted around this shrimp, y’all! SO GOOD! But have you ever tried eating slices of cucumber while stairing at a plate of luscious buffalo-sauced shrimp? It’s cruel and unusual punishment, I tell ya! I cannot be stopped. I created this sassy shrimp dish in partnership with the awesome folks at Marina del Rey using their delicious wild-caught shrimp, and have quickly fallen in love with this company. I can pick up their shrimp (which is crazy affordable by the way at 15.98 for a 2 pound bag of JUMBO 16/29 shrimp) at my local Sam’s Club and since it’s already frozen, I have ample time to use and defrost it when I’m ready to get my shrimp on! Their enviormentally responsible Argentinian shrimp are plump, tender, and naturally pink — great for everything from party-perfect shrimp cocktail to luscious shrimp scampi. I seriously could not be more excited about this brand and they’ve basically just earned a customer for life because I am in LOVE with their shrimp! I’m also crazy in love with these buffalo shrimp tacos! Ready for the recipe? Let’s do this! These tasty tacos are ready to take Taco Night to the next level! Make a few for a low-key dinner or double/triple the recipe to feed a crowd. Set defrosted shrimp in the fridge, covered, while you prep your tacos. Wash lettuce and chop your choice of veggies from the topping list. Heat a large pan or skillet to medium-high heat with 2 tsp of butter or oil (I used butter) and sauté your shrimp. Season with paprika, garlic powder, cayenne pepper, salt, and black pepper. Cook on each side for about 2 minutes until shrimp curl and become opaque. The cook time will depend on the heat setting you choose and the size of your shrimp, but regardless they’ll be perfectly cooked in a matter of minutes. Add buffalo sauce to pan and mix to coat while the pan is still hot. Shrimp may be added to the tacos whole or chopped into bite-sized bits - both are great options! Pile the shrimp on your lettuce and top with your choice of tasty taco toppings. Have fun with it! Anything goes in love and tacos. * To make a Whole30 compliant buffalo sauce simply mix 1/4 cup of Frank's Red Hot sauce with 1-2 TBSP melted clarified butter (or ghee) and whisk well. ** I like to double up with two lettuce leaves per taco, though feel free to use singles if preferred! I used romaine lettuce but Bibb lettuce or butter lettuce cups work great too! You can also totally use flour or corn tortillas here if that's what you have handy - they're great every which way! Nutrition Facts below are an estimate gathered using an online recipe nutrition calculator. Recipe calculated before toppings; add your favorites and adjust as needed. Can I eat this forever? Also, you should go stalk MDR on social media and tell them how much you love this recipe because I basically want to work with them forever. This sponsored recipe was a total blast to develop and oh so tasty too! You can find them on Instagram, Facebook, and Pinterest. Want to track down a bag to try? Easy peasy! They’re available at Sam’s Club location across the US in the freezer aisle. I’ll pretty much be buying this shrimp on a weekly basis to make my Cajun Shrimp Pasta, Hot Shrimp Dip, and Pesto Parmesan Shrimp Spaghetti Squash recipes. A serving of shrimp is usually 3-6 ounces or so and I’ve managed to eat 32 ounces in two days. I’m not even remotely sorry. Worth it! vegansaurus chefs: veganize this recipe with my tasty buffalo roasted chickpeas! The buffalo sauce can be made with vegan butter and hot sauce or you can use straight up hot sauce for an extra fiery kick! no lettuce? no problem! You can use flour or corn tortillas for this tasty taco recipe. paleo or whole30 swaps: simply use ghee in place of butter for and skip the optional ranch + you’re good to go! 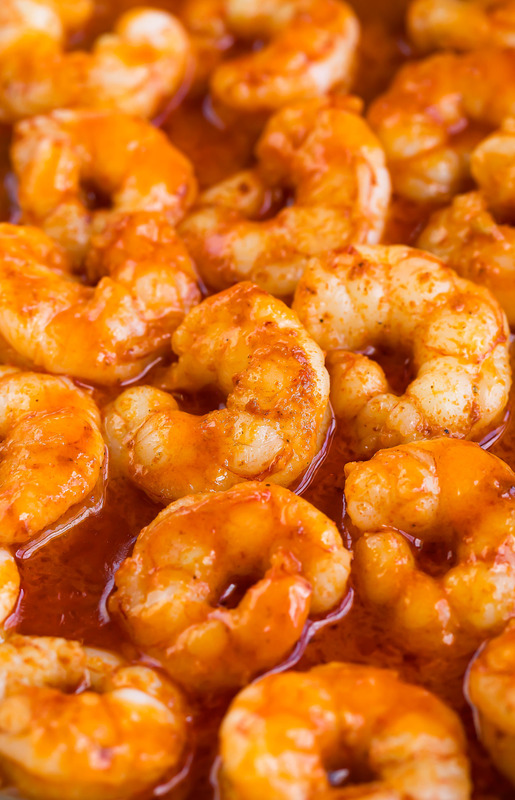 You could even turn these baller buffalo shrimp into a big ole salad if you’d like! The possibilities are as delicious as they are endless. WOOT! I went light on the butter in my buffalo sauce so I could cook my shrimp in a wee bit more butter because #TREATYOSELF2017 but you can 100% use as much or as little as you’d like for these buffalo shrimp lettuce wrap tacos. Paul likes to use butter and beer (some for him, some for the shrimpies) and I’m just like, seriously let me at that buttahhhh yo! Vegan butter also works marvelous here (as does avocado oil or your favorite healthy oil) and if you go straight hot sauce for this recipe you’ll save calories and add fiiiiiiire! Totally adjust to taste but I hiiiiighly recommend the measurements in the recipe for maximum yum-factor. Looking for a little ranch action to round out your buffalo sauce faceplant? This Greek yogurt ranch goes great with these buffalo shrimp lettuce wrap tacos! Directions: Heat minced garlic in a little bit of oil (you can do this on the stove or in the microwave) until hot. This infuses the oil with garlicky goodness and cuts the bite of the raw garlic. Whisk all ingredients together and set aside. Leftover ranch can be stored in the fridge (it even tastes better the next day!) and enjoyed the following 2-4 days. 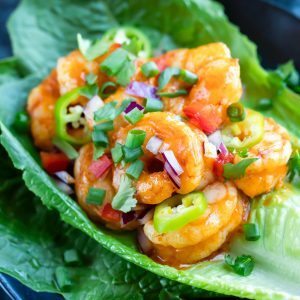 It’s fabulous drizzled on these Buffalo Shrimp Lettuce Wrap Tacos and great as a dip for veggies too! Dude, what are you waiting for? 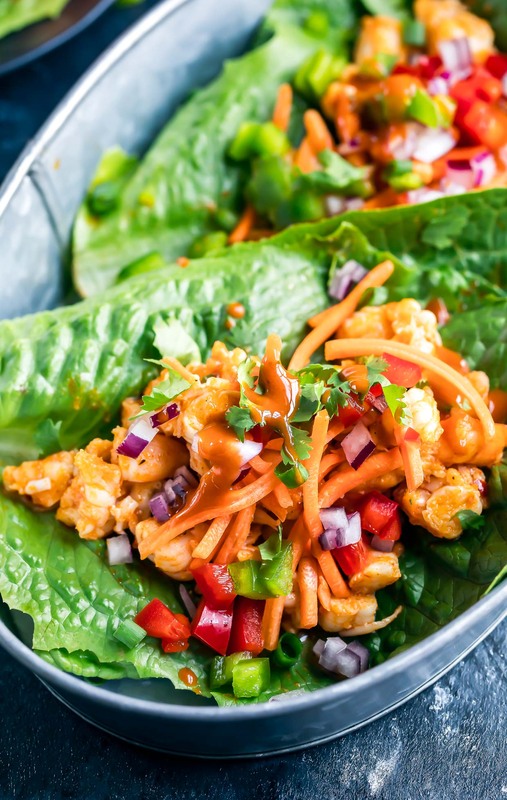 Make these buffalo shrimp lettuce wrap tacos right meow! Then tag your photos #PEASandCRAYONS @PEASANDCRAYONS so I can see your creation. Can’t wait! I want to take this to a book club as an appetizer. If I let the filling cool slightly then fill my lettuce cups do you think that will work. We eat upon arrival so I am not worried about food safety too much. Thanks. Hi Peggy! I’ve brought these to a friend’s house and what I wound up doing was just pouring the saucy shrimp into a bowl with a lid and then put the lettuce and toppings on a tray. We served it up with a spoon in the shrimp bowl and everyone just spooned the shrimp and toppings onto their lettuce wraps and dove in! Hope this helps! Thanks for replying. I served it exactly as you suggested. I let everyone make their own taco. I had a few of the veggie toppings, crumbled Bleu cheese and Bleu cheese dressing. The only major change I made and it was major, was to use crawfish instead of shrimp. 1. I am allergic to shrimp, but not crawfish. 2. And crawfish went with the book theme. And this girl loves a theme! Finally! IT WAS A HUGE HIT!I LOVED IT. MY BOYFRIEND LOVED IT. THE 16 OTHER WOMEN LOVED IT! Will definitely make it again. THANK YOU! These look really amazing. I’m hoping my kids will eat these too. But if they don’t, more for me! These look amazing! Cannot wait to try these! It really does look like the best! I think I would have been tempted to eat it too before taking the photos! I have a serious problem with my family stealing food in the middle of my photo shoots…lol. This recipe is definitely going on my must try list! These tacos looks absolutely delicious! These will be such a better option for me to nosh on for game day. I always forget how much I love shrimp! This looks gorgeous and absolutely delicious! Looking forward to trying it! I seriously love this recipe — I am addicted to Franks, but hate the blue cheese in most “buffalo” recipes. This proves how unnecessary it is! I’d eat these forever, Jen! I love when healthy eating is DELICIOUS! Love your Whole30 compliant hot sauce too, that’s super helpful. Such wonderful color contrast . I cant imagine not being tempted by these. Love to try them. What a great idea to have a taco in Bibb lettuce. Love that and the spices! Beautiful and super delicious looking recipe! I can’t wait to try it and those shrimp! This looks so easy to make and so delicious. I have some people over the weekend so this would be the perfect appetizer to serve. I am inspired and absolutely drooling. Should have had lunch before coming by to visit. I am making these as soon as possible. I love the Marina del Ray shrimp and am always looking for a way to cut those pesky carbs. I bet the flavor is fantastic – I know the photos are! Printing, sharing and pinning! I’m smiling like a crazy person cos these have everything I love. We need to have a Marina del Rey shrimp party, girl! And I’ll bring some scallops too! You’ve created euphoria on a plate! Oh WOW Jenn I’ve never thought of Buffalo shrimp! And in lettuce wraps?! Simply brilliant!! Love it and will absolutely make it asap! WOW!!! I am seriously craving some of these tasty and healthy wraps! Stunning photos and awesome recipe! Jenn I can’t wait to try these out! 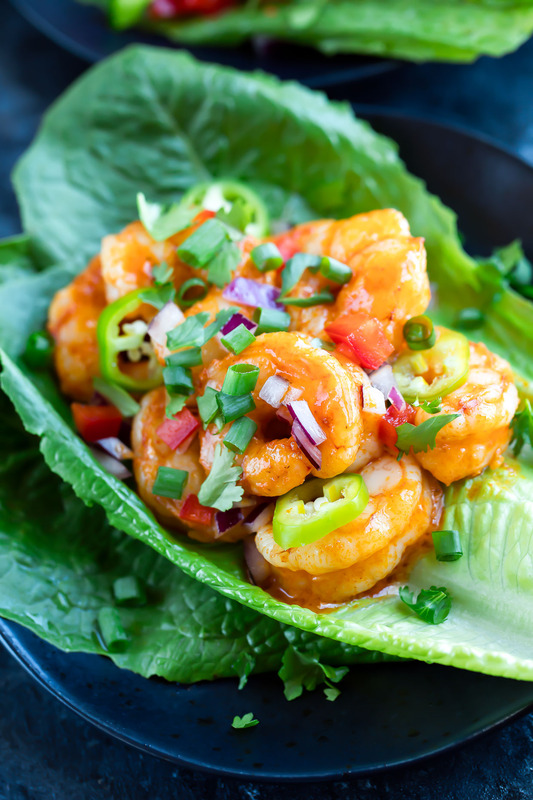 Absolutely LOVE lettuce wraps, and Marina del Rey buffalo shrimp?! OMG you’ve got me sold! I can’t wait for you to try them Taylor! Thank you so much! Say Buffalo Shrimp and Marina del Rey and I’ll follow you anywhere, Jenn, these look insanely good. These look amazing! I love how you did them as lettuce wraps also. That greek yogurt ranch sounds really tempting as well. Think I need to give that a go! I could put that greek yogurt ranch on everything! So stoked for you to try it! Oh my gosh these look incredible Jenn! The color on the shrimp screams big buffalo flavor and I want these for lunch today! Thank you Marcie! The buffalo flavor is bold and addictive for sure! What a fun Taco Tuesday! These look so fun AND delicious. I’m loving all of the bright colors — so incredibly appetizing! Thank you Bintu! Hope you adore it! I can see why these would be hard to resist while photographing! They look sooo fresh and good! I love that you use lettuce wraps – it makes the whole experience so light! Yum! These shrimp look absolutely incredible. Love all those flavors. Such a great gluten-free, paleo dish. Oh my… YES! These lettuce tacos look so amazing. SO flavorful. I’ve never tried shrimp tacos… can you believe that?! Now I just MUST! 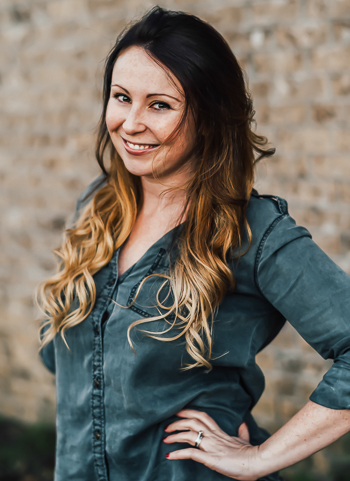 I am so super stoked for you to try them girly! Hope you get a chance to and loooooove this recipe as much as we do! Thanks chica!